​Eleven-year-old Tyler Davis moves from Miami, Florida, to Williston, North Dakota with his mom during Christmas vacation. His first day of school at his new elementary school is an absolute disaster! Miraculously, he gets a chance to live the day all over again—this time with the help of a magic cell phone. You won’t believe what happens! The Worst Day of School Ever—Do-Over (Snow in Sarasota Publishing, ISBN 978-0-9837685-7-9, paperback, $9.99) is an exciting, humorous adventure for ages 8 and up, illustrated in color by Mandan Middle School students from Mandan, North Dakota. Much of the book takes place at a fictitious Phil Jackson elementary School in Williston, North Dakota, and the book is also dedicated to Phil. Jackson, the pride of North Dakota, the greatest coach ever in the NBA, having won eleven championships with the Lakers and Bulls. He also won a high school state championship in basketball starring for Williston High School in 1963, and an NBA Championship as a player for the New York Knicks in 1973. The book was written by Dr. Kevin Kremer, longtime North Dakota teacher now living in Sarasota, Florida. Kevin watched Phil Jackson play high school basketball when he was a little boy in Mandan, and he followed Phil all the way through his playing and coaching career. Kremer has written, edited, and published more than 100 books, but he loves writing children’s books the most. 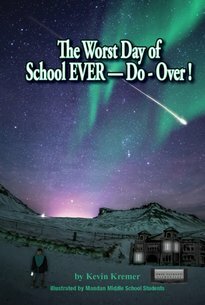 The Worst Day of School Ever—Do-Over is available in paperback for $9.99 at KevinKremerBooks.com and as an e-book for only $5.99, wherever e-books are sold. The Worst Day of School Ever—Do-Over; 7.6 in. X 5.3 in., paperback, 164 pages, six color illustrations, ISBN 978-0-9977126-0-5; $9.99 paperback; $5.99 e-book.